When you’re shopping for school lockers for your facility, you want to be sure you’re choosing a durable material that can withstand the impact of students unloading their books, gym clothes, sports gear and other belongings. There are many different factors to consider when shopping for lockers for your school. Read on to find out the five questions you should be asking. 1. How durable is the material? School lockers face a lot of harsh wear and tear daily, so it’s important to choose lockers that are made of a durable material that can withstand this use. The traditional option for hallway lockers is metal but they can come with a lot of drawbacks. They’re prone to dents with minimal impact which can compromise the aesthetics of the lockers and will end up costing a lot of money for repairs and replacement. A impact test was conducted following ASTM standards that showed Duralife Lockers had 59 times greater resistance to impacts when compared to metal lockers. Constantly having to perform maintenance on your school lockers will become expensive in the long wrong. You want to be sure that the lockers you’re choosing are low maintenance to save you from this cost. Traditional metal lockers have a lower initial cost than plastic lockers, making them an economical choice for schools. However, there are hidden costs such as additional expenses associated with cleaning, painting and the general maintenance of these lockers on an annual or semi-annual basis which may be overlooked. By comparing the true cost of a traditional metal hallway locker to a Duralife HDPE locker over a 20 year period a study was done to take into account the initial cost, maintenance, dent and scratch repair, painting cost, graffiti removal and replacing damaged and corroded parts to create a cost of ownership model. Within 2 years, Duralife HDPE lockers are less expensive than metal. In 20 years, the accumulated savings are substantial. 3. How much noise do they produce? The noisy clanging that comes from shutting a metal locker can be distracting as it rings throughout the hallways, so look for an option where the sound is muffled. Duralife Lockers are 3 times quieter than metal lockers and reduce noise in the hallway. This eliminates distractions from the hallways and leads to a better learning environment. The difference between that is a metal locker noise would be equivalent to an alarm clock 2 feet away where the Duralife locker noise is considered similar to that created by a washing machine. 4. Are the lockers made of sustainable material? Some major traditional metal locker brands do not meet the strictest standards for air quality and sustainability. These products are not Greenguard Certified. The Greenguard Certification Program gives assurance that products designed for use in indoor spaces meet strict chemical emissions limits. This contributes to the creation of healthy interiors. Duralife Lockers are Greenguard Gold Certified and meet the strict criteria for products intended for use in schools, as well as other environments where children spend a lot of time. With Duralife Lockers, you can be confident that the lockers are not having a negative effect on your school’s air quality. 5. Are the lockers visually appealing? It’s also important that the lockers are aesthetically appealing in your facility. You want people to come into your school and see it as a respectable environment. DuraLife Lockers have appealing vents throughout and a clean-looking surface. There are also built in handles and combination locks that are recessed to improve student safety. 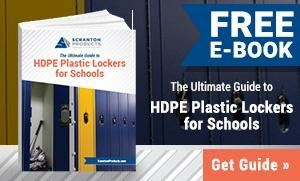 To learn more about Scranton Products’ DuraLife Lockers download our free eBook, The Ultimate Guide to HDPE Plastic Lockers for Schools. The Duralife 123 Challenge: Do Your School Lockers Pass the Test? School personnel including teachers, principals, facility managers, PTA members, and superintendants all around are taking the Duralife 123 Challenge to find out if their school lockers pass the test. Lockers line the hallways of schools and face harsh wear and tear every day as students unload their books and belongings, open and close them between every class, and even draw on them. Will your school lockers pass the test? Take the Duralife 123 Challenge to See for Yourself. You may think that metal lockers are more durable than plastic lockers, just like some of the school personnel who took the Duralife 123 Challenge, but they quickly found out that High Density Polyethylene (HDPE) Duralife Lockers are far superior. The first test of the Duralife 123 Challenge is to use forceful impact against a metal locker, then again against an HDPE plastic locker. After hitting both lockers with a hammer, the school personnel found that the metal lockers were easily dented with little force while HDPE plastic lockers could be hit as hard as possible and did not leave a mark. Traditional metal lockers are usually made from 16 gauge steel which is less than 1/16 inch thick material. This thin material makes metal lockers prone to denting and other types of damage. But Duralife Lockers are made of 1/2 inch thick rigid HDPE plastic, which makes them 59 times greater in resistance to impact than metal lockers. Graffiti is a big issue when it comes to school lockers. Students may write all over their lockers, leaving damage and making your school appear in a negative light. It’s important to avoid a locker material that makes it difficult to clean graffiti off, and it’s also costly to utilize various cleaning methods in an effort to do so. You may also have to end up replacing the lockers or repaint them which is very costly. The second test of the Duralife 123 Challenge is graffiti. School personnel wrote on a metal locker and a Duralife Locker with permanent markers, and then they attempted to clean the marker off. As they tried to wipe the marker off the metal lockers very little came off and the graffiti was still very visible, , But when they wiped the marker off the HDPE plastic lockers, there was no residue left with little effort. One big issue with metal lockers is the noise they produce when students close them. Hearing this loud sound ring throughout the halls is enough to give anyone a headache, and it’s particularly distracting to the students in class when they hear various locker slams in the hallway. The third and final test of the Duralife 123 Challenge is noise. School personnel slammed a metal locker then slammed an HDPE plastic locker to see which one made more noise. Metal lockers made a loud sound, while HDPE plastic lockers made a more muffled, quieter sound. So take the Duralife 123 Challenge today and find out if your school lockers pass the test. To learn more about Scranton Products’ DuraLife Lockers, click here to download our free eBook, Sustainable Building Products: How to Make Your Facility Eco-Friendly from Top to Bottom. https://www.scrantonproducts.com/wp-content/uploads/2017/01/CA-5.jpg 764 1148 sschanke_51w0yw3f https://www.scrantonproducts.com/wp-content/uploads/2019/02/Scranton-Products-Full-Color-Logo.png sschanke_51w0yw3f2018-12-05 18:18:092018-12-06 16:58:59The Duralife 123 Challenge: Do Your School Lockers Pass the Test? HDPE vs. Metal: Which Material Comes Out on Top? When youâ€™re searching for products for your facility, one of the most important factors to consider is material. The material of your products makes all the difference when it comes to durability, sustainability and aesthetics. You also want to make sure that youâ€™re purchasing materials that will hold up over time Some popular materials include high density polyethylene (HDPE) and metal. If youâ€™re torn between the two or youâ€™re just looking for more information, keep reading to find out which material is the better option based on what matters most to you. You want to make sure that the products in your facility add to your building, or blend in, rather than standing out and looking unsightly. Traditional metal lockers have vents and handles that protrude from the surface, which is not aesthetically pleasing. These protruding elements may also lead to bumps and scrapes and reduce safety in the facility. HDPE plastic lockers have vents built into the surface with recessed handles and locks for a smooth, clean look. The recessed handles and locks help to improve safety by eliminating the risk of bumps and scrapes. Overall, HDPE plastic holds up better than metal against damages such as impacts, scratches and even graffiti. Impact: Traditional lockers are made from 16 gauge steel which makes the material less than 1/16â€ thick. HDPE plastic lockers are made of Â½â€ thick rigid HDPE plastic which makes them 59 times stronger and resistant to impact than traditional metal lockers. Scratches: Scratches are also commonly seen on metal lockers which expose the metal underneath the paint. This requires paint to cover up or complete replacement. However, HDPE plastic lockers are one solid color throughout. You wonâ€™t have to spend time and money covering scratches or chips in the pain. Graffiti: If you have to deal with graffiti in your facility, youâ€™ll want to choose a material that can easily be cleaned. Markers can be very difficult to remove from metal lockers, and could even leave behind residue. But because of HDPE plasticâ€™s non-porous surface, graffiti readily wipes off. Stickers and contact paper can also be easily removed. Choosing materials that constantly need to be repaired, replaced or cleaned gets costly. While budget is always an important factor in choosing materials, it’s crucial to understand that products that are the least expensive initially could end up costing you in the future. Traditional metal lockers have a low initial cost, making them a top choice for facilities. However, additional expenses for these lockers, such as cleaning, painting and general maintenance will add up. The initial cost of metal lockers is lower than HDPE plastic, but HDPE plastic is less expensive over time. If youâ€™re considering installing lockers or bathroom partitions into your facility, consider HDPE plastic over metal lockers for durable and sustainable products. Click here to find out where to buy Scranton Products. https://www.scrantonproducts.com/wp-content/uploads/2017/06/Danville-pic-1.png 383 575 sschanke_51w0yw3f https://www.scrantonproducts.com/wp-content/uploads/2019/02/Scranton-Products-Full-Color-Logo.png sschanke_51w0yw3f2018-11-21 10:30:122018-12-03 20:06:45HDPE vs. Metal: Which Material Comes Out on Top? There is an art to creating a great fitness center. In addition to providing the latest equipment, friendly knowledgeable trainers, clean locker rooms, and lots of hot water, your locker room needs to breathe. Unfortunately many locker room ventilation systems are improperly designed, leading to issues such as high humidity, mold, corrosion, nasty odors, and unhappy members. On the other hand, a well-designed ventilation system means happier members, reduced maintenance, and increased sales. Locker rooms are constantly bombarded with moisture from members who come in perspiring after workouts; from the humidity released when they shower; and by the moisture released in steam and sauna areas. That’s why it is critical to provide effective dehumidification combined with an exhaust system designed to capture and exhaust large quantities of moist air out of the building. If the excess moisture in the locker room is not properly vented, it will affect lockers, benches and other assets, and migrate to other areas of the facility. In addition to proper ventilation, also consider the following when designing your locker room. Locker rooms – and the lockers in them – can be breeding grounds for mold and bacteria. Manufactured from solid HDPE, Tufftec Lockers® stand up to the many challenges of the locker room environment. Moisture is never an issue. Tufftec Lockers® are impermeable to moisture, resistant to mold and mildew, and will never rust, corrode, or delaminate. They are also naturally bacteria resistant and will not support the growth of bacteria, including MRSA. Easy to clean, and impact and dent resistant, Tufftec Lockers® will preserve their good looks for years to come. And most importantly, your investment is backed by the best warranty in the industry. Selecting Scranton Products Tufftec Lockers® for your facility is a sound investment that will help keep your locker room odor-free, reduce your maintenance sots, and keep your members happy for many years to come. To find out more about Tufftec Lockers® and our customizable locker solutions, please click on the link below. How to Improve Your School’s Learning Environment Noise is defined as “a sound, especially one that is loud or unpleasant or that causes disturbance.”According to a study conducted by researchers at Cornell University, students had more difficulty learning to read when subjected to continuous noise, such as airplanes taking off, compared to students learning at quieter schools. These findings, as well as similar findings from other studies, support the claim that noise can significantly affect a student’s ability to learn. However, noise doesn’t necessarily have to come from a busy airport or highway. Noise from the cafeteria, gymnasium, or hallways can negatively affect the learning environment of any classroom nearby. In this post, we take a closer look at what you can do to reduce noise and improve the learning environment within your school. Repair/Maintain Ducts, Fans, and the HVAC System A properly functioning HVAC system should produce only a slight whooshing sound. Meanwhile, ducts and fans should be virtually silent. If any of these are making loud or distracting noises, it could be a sign that they need repairs. Stay up-to-date on building maintenance to keep systems working effectively and sound levels at a minimum. Dampen Noise from Chairs and Desks Depending on the kind of furniture in your classroom, chairs and desks sliding across the floor can create a considerable amount of unwanted noise. To help reduce the noise from these objects, dampeners can be placed on the feet where the chair or desk meets the floor. An old solution was to cut a small slit into a tennis ball and then fit the leg inside to create a type of shoe. Today, much more effective and stylish solutions are available. Install Drapes Over Windows Thick windows do an exceptional job of blocking out unwanted noise, but adding thick drapes can add an extra level of sound protection. Of course, you may not want to cover up windows during the daytime if they offer the primary source of light. Instead you can invest in soundproof windows, plant shrubbery outside the windows, or install lighting fixtures to provide enough light so you can close the drapes. Use Plastic Lockers in Hallways Metal lockers can cause a considerable amount of unwanted noise, which can distract the students in any classroom that might be nearby. Plastic lockers provide a perfect alternative to metal lockers, producing a fraction of the noise. Plastic lockers made from high-density polyethylene (HDPE) are also much easier to maintain thanks to their natural resistance to rust, dents, and graffiti. Soundproof Walls, Floors, and the Ceiling It’s widely known that sound waves easily bound off hard, flat surfaces. Meanwhile, soft surfaces absorb sound. So if you’re looking to limit the amount of noise in your classroom, you might consider using soft carpeting rather than tiles or hardwood flooring. You can also install sound-absorbing panels on the walls. Finally, ensure than any gaps between the ceiling panels are sealed. Although the only quiet classroom may be the one without students, it’s possible to keep noise levels low so you can build a better learning environment for your students. Follow these tips to help reduce the negative effects of noise. An Excellence in Construction Award can go a long way for a high school. It shows that you truly care about the quality of your high school and want to provide your students with the best materials for the most comfortable learning experience possible. Ocean City High School in Ocean City, NJ, earned an Excellence in Construction Award for a unique reason that should be noted by facility managers and supervisors in high schools across the country. The school’s HDPE plastic lockers were a driving force that led to the award. Continue reading to learn more about the impact that HDPE plastic lockers can have on issues that high schools encounter. For Ocean City High School, investing in lockers that would reduce the need for and cost of future maintenance was of the utmost importance. One of the major issues they were encountering was corrosion, seeing that the high school is just a few miles from the shore. In the past, the high moisture and salt content in the air was entering the building and causing rust and corrosion on their metal lockers. Graffiti removal also was an issue at Ocean City High School. In the past, removing graffiti was a time-consuming and costly task that sometimes resulted in the need for all new locker parts. Scratches and dents were another issue that decreased the visual appeal of the school’s interior. Combined, these three issues were negatively affecting Ocean City High School, and the school needed a solution when shopping for and installing new lockers. To combat the issues that Ocean City High School was experiencing with their metal lockers, they decided to take advantage of the more durable choice of HDPE plastic from Scranton Products. During the seven years that the HDPE plastic lockers have been installed, there have been significant improvements. Ocean City High School hasn’t experienced any locker break-ins, no required maintenance because of broken parts, and no noticeable signs of scratching. Thanks to the HDPE plastic material and easy-apply associated cleaner, graffiti removal has been significantly easier, saving time and money because there’s no need to repaint lockers. All in all, the switch from metal lockers to HDPE plastic lockers has benefitted Ocean City High School in numerous ways, including recognition as a high school that strives for excellence in construction. The Excellence in Construction Award can go a long for a high school that wants to create an aesthetically pleasing architectural design that will hold up and look great over time without the need for maintenance. Ocean City High School was able to do just that thanks to the implementation of HDPE plastic Duralife lockers from Scranton Products. One of the most important factors that designers and facilities managers must consider when selecting materials for their projects is the total cost of ownership of those materials or products. Total cost of ownership is the true cost of a product, taking into account not only a product’s initial purchase price as well as its lifetime costs. For instance, a second-hand car with an appealing purchase price may turn out to have maintenance costs that will make it considerably more expensive to own over the long-term compared to a brand new car that comes with a three-year warranty. If you don’t do your homework to check out how good a deal the car really is, you might wind up paying more for the second-hand “bargain” than you would have paid for the new car. When selecting bathroom partitions, there are multiple factors to consider when deciding on the best choice for your project. Design, color, and texture choices must work with the total bathroom concept, and the partitions must provide a range of flexible configurations and options. In addition, the material the partitions are made from should be attractive, durable and easy to care for, and the purchase price should be a fair price for what you are getting. Once you’ve checked off all those boxes, there is one more box left to consider. It’s important to look not only at the purchase price of the partitions you are considering, but also at what it will cost to maintain and repair those partitions over their expected lifetime, and how well the product warranty protects your investment. Just like the person buying the used car, if you don’t’ carefully consider what your purchase will cost over time, you’ll wind up paying a lot more than you ever expected. The chart below compares the initial and total costs of four of the most widely selected types of partitions over a 25-year period, based on replacing each type of partition at the end of its warranty period. Over a 25-year period, Scranton Products HDPE partitions cost significantly less than the other materials, while providing the longest life cycle due to their performance, durability and long warranty. When selecting the right material for your partitions, take a close look at what’s inside. Constructed of 1” premium HDPE resin, Scranton Products bathroom partitions are solid throughout and will never absorb moisture. Impermeable and non-porous, solid plastic HDPE does not support the growth of mold, mildew, and bacteria. With the exception of Scranton Products solid plastic HDPE, the products below are constructed with either a cardboard, particleboard or kraft paper core. These products are at high-risk for moisture penetration, and are subject to mold and mildew. Formulated with a solid color throughout, Scranton Products HDPE will never chip. In addition, in an impact test conducted following ASTM standards, Scranton Products solid HDPE plastic had 59 times greater resistant to impacts, dings, and denting when compared to metal. Scranton Products HDPE bathroom partitions will never rust or corrode, and never require painting, significantly reducing maintenance costs. Graffiti can be easily wiped clean with a common non-abrasive cleaner, and scratches are difficult to see and can be easily repaired. In addition, Scranton Products bathroom partitions are fully power washable and steam cleanable, reducing cleaning time and costs. To protect your investment, Scranton Products backs its partitions with a 25-year warranty – the best warranty in the industry. When considering bathroom partitions, look for partitions that offer a true low cost of ownership and that provide an outstanding warranty to protect your investment. Invest in Scranton Products HDPE – the smart choice. To learn more about how Scranton Products partitions are the smart choice, download our cost of ownership brochure. When redesigning a commercial bathroom or adding lockers to a locker room or hallway, architects are burdened with a significant amount of detailed planning. Functionality, convenience, and design need to be considered through each step of planning to completion. Because of the numerous working elements that go into building a new bathroom or locker room, it’s easy for architects to overlook some crucial aspects of two of the most important pieces of infrastructure in the entire design: bathroom partitions and lockers. To work toward a more convenient and more cost-efficient commercial bathroom and locker installation for architects and facility managers, Scranton Products is here to highlight seven crucial mistakes that architects may make when choosing bathroom partitions and locker materials. Here’s a list of the most common mistakes you’ll want to avoid when picking out your bathroom partitions or locker materials. Too often, architects forget about the importance of the durability of locker and partition material. It can be easy to think that since these materials aren’t exposed to the natural environment, their durability doesn’t matter. However, many factors can affect the lockers or partitions and even reduce their physical appeal, such as graffiti and scratches. The more durable your lockers and partitions are, the less those factors will contribute to devaluing them. If you take the time to look into high-density polyethylene (HDPE) material, you’ll see how it can improve the durability of your partitions and lockers. Bathrooms and locker rooms can be cesspools of germs and bacteria. Thanks to high levels of moisture, it’s easy for bathroom partitions to accumulate mold or mildew that require rigorous washing with multiple chemical cleaners if they’re made of phenolic or solid color reinforcement composite (SCRC). Equipping a public bathroom with one of these materials is still a common mistake among architects. Opting for HDPE bathroom partitions such as Hiny Hiders Partitions gives you more microbial resistance for a cleaner and healthier bathroom. You’ll want to choose a strong material, like HDPE, that can withstand these common issues. • HDPE Hiny Hiders Partitions are 100% recyclable and are available with up to 100% post-consumer content, unlike phenolic material and SCRC. • HDPE Hiny Hinders Partitions feature 25% to 100% pre-consumer content, while SCRC has none and phenolic material has a maximum of 22%. • Unlike phenolic material, HDPE Hiny Hiders Partitions have low-emitting materials and are free of urea-formaldehyde resins. The noise made from just one locker being slammed shut can be excruciating. Now multiply that by 10, 15, 20, or more, and you’ll have one booming sound. This is a critical aspect of lockers that architects don’t tend to account for when selecting their locker material. If you’re building lockers in hallways or rooms with shared walls, you want to be sure that you opt for the quietest ones available. Too often architects automatically settle on metal lockers, which create a loud, distracting environment around the locker room. HDPE Lockers are built to be three times quieter than generic metal lockers. A mistake that architects frequently make is overlooking the aesthetics of different locker materials. While it’s easy to think that all lockers essentially accomplish the same goal and that their looks don’t really matter, there are some significant benefits that go far beyond beautification. For example, traditional metal lockers continually fail to advance their design with their protruding vents and bulky locks. Duralife HDPE lockers solve both of these issues by breaking away from the confines of generic and bulky locker construction. Duralife lockers have vents cut into the locker surface and have built-in combination locks, resulting in a sleek-looking locker that eliminates the risk of students getting clipped by locker pieces extending past the surface. Fortunately, HDPE bathroom partitions and lockers are designed to withstand these harmful issues. That means maintenance costs of HDPE material is much lower, so over time, they’re a financially viable solution compared to their competitors. The result is usually bathroom partitions and lockers that don’t perform as desired. The truth is that many architects frequently make these mistakes because they don’t know about the benefits of HDPE materials. When you choose HDPE Hiny Hiders bathroom partitions or Duralife lockers, you opt for materials that are more durable, safer, convenient, and more cost-effective, leading to lower maintenance costs and a longer lifespan. Want to learn more about HDPE products can benefit your facility? Contact us at Scranton Products! Whether you plan on building from the ground up or you’re performing some much-needed renovations at your school, you should consider a wide array of factors when selecting your building materials. However, while the foundation may be strong and reliable, you may want to consider changing some of the interior materials, like your lockers. As a facility manager, you should consider all your options, not just for cost, but also for longevity. When it comes to choosing lockers, you’ll want to be sure that you’re making the right decision. When you’re looking at the costs related to new lockers, their life span should be considered. Ordering a new set of lockers is a major investment for your school, so you want to be sure that the lockers will last for a long time without having to be replaced soon after installation or repaired extensively. During your research, you should look at products at both ends of the cost spectrum. While cheaper materials may seem to be the better option, they may actually end up costing you a lot more by wearing out sooner than expected. Sometimes, spending more upfront on higher-quality materials can be the most cost-efficient decision down the line, as the lockers may hold up better, while the cheaper alternatives may require extensive maintenance and repairs. After you’ve found some great locker options, you’ll want to compare them as far as durability and longevity to see which locker material is the best choice for your school. Metal is the most popular material used for lockers due to its strong construction and easy installation. However, there are some issues with metal lockers that may alter your choice of this material. Rust is a major factor to consider. This is more common in locker rooms, but once present, rust removal can be time-consuming and painstaking. Metal lockers also require a fresh coat of paint every so often, which can lead to harmful VOC emissions. A material that some facility managers use instead of metal is HDPE (high-density polyethylene), which is a highly durable solid plastic. Choosing HDPE over standard metal has many advantages. The number one advantage is that HDPE lockers have a greater impact resistance than metal, resulting in fewer dents and surface damage than normal metal lockers. And since HDPE is a performance plastic, it isn’t susceptible to rust growth. It can even stand up to mold growth due to its solid plastic construction. Keeping up with locker maintenance is important. Whether the lockers endure heavy damage or some light scratches, it’s important to address the issues early on. After about five years, metal lockers will require paint, maintenance, and of course, cleaning. However, when you choose HDPE as your locker material, you only have to perform some light cleaning, as heavy maintenance and repainting aren’t necessary. After 10 years of use, HDPE lockers will require some minor maintenance, while metal lockers will probably need multiple paint jobs, as well as more involved maintenance to ensure that the lockers are in good shape to continue serving their storage purposes. While metal lockers may seem to be cost-effective during installation, they can become more costly over time when they require a lot of attention and maintenance. HDPE locker materials, on the other hand, require little maintenance and no paint touch-ups. You don’t have to hire crews to conduct extensive maintenance on the lockers due to their solid construction and their material that’s resistant to most locker-related issues. They mainly require sporadic cleaning rather than an entire time-consuming and costly repainting process. Choosing HDPE material over metal is a smart choice when factoring in the total costs of the lockers and their maintenance. When it comes to making the final decision of which type of lockers to use at your school, you’ve seen here that there are a lot of factors to consider to make the best choice for your school and budget. You learned that metal can be a useful material for your lockers, but it’s not without its flaws. But determining which material you inevitably go with shouldn’t be too hard once you look at the projected life span of each material while factoring in the expected maintenance and repair costs. You’ll see which option is better for your school in term of quality, longevity, and sustainability. Want to learn more about how to choose the right lockers for your school? Check out this blog post, School Lockers Ranked by Durability, Longevity & More, from your friends at Scranton Products. Is Your Public Restroom Federal Regulation Compliant?